House, Baltimore, MD. Bottom IMDA Alumni Gary Kachadourian mixed bioplastics; “Nameless 1300” trash bags, Arduino, servos, fans. 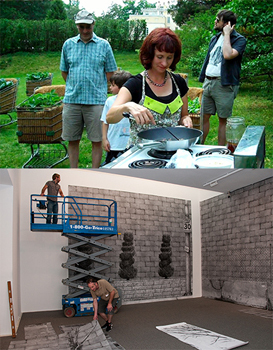 installing Interior \\ Exterior, Baltimore Museum of Art, 2012. MAP [ Maryland Art Place ], 2015. Photography by Marlayna Demond. Apply here. Applications received by February 1 will receive full consideration towards admission and financing. UMBC’s Intermedia+Digital Arts [ IMDA ] MFA program invites interdisciplinary artists seeking to expand or reinvent their practice to apply. The IMDA program is committed to art that poses unique conceptual and social challenges while offering an environment that provides artists a studio, teaching opportunities, courses in emerging methods, contemporary art and theory, engaged faculty and high-end research centers that are typical of a research university. 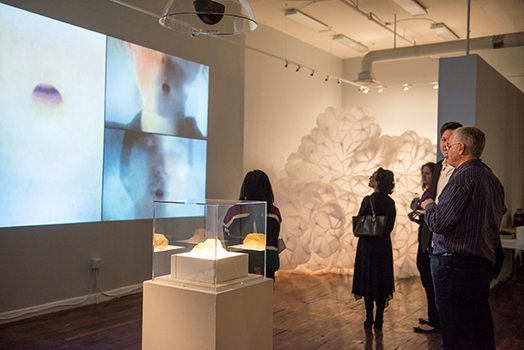 During their course of study, IMDA students take advantage of Baltimore’s vibrant art scene, airwaves of analog and digital data, and the white walls of the prestigious Center for Art, Design, and Visual Culture (CADVC), while pursuing issues such as food justice, the environment, transportation, urban communities, translation, race and gender identity, gift economies, and technology in both intellectual and formal terms. State-of-the-art facilities in a variety of media-based disciplines result in forms that include street interventions, distributed networks, games, installations, performances, sculptural objects, prints, drawings, photographs, videos, interactive pieces, physical computing, and 3D maker output, public displays, and other socially engaged works. Financial packages include Research Assistantships in teaching and research on a competitive basis. Students are also eligible to apply for a variety of internal research and merit-based grants to support their work. Non-Maryland Research Assistants, including international students, pay in-state tuition. For more information on financing see the graduate school website. Max Becher, David Rokeby, Pual Rucker, Mark Tribe, Ted Victoria, Fred Wilson, Martha Wilson, Karen Yasinsky and The Yes Men. The most notable outcome of the IMDA MFA program is that graduates are prepared for a lifetime of creative productivity, having acquired the skills, focus, and commitment that will consistently propel their adventurous and personal artistic practices to a new level. IMDA alumni present their work at distinguished museums, galleries, festivals, conferences, and symposia around the world and have garnered support from prestigious granting sources including J. William Fulbright, Janet and Walter Sondheim, William J. Baker, Jr. Memorial Fund; and Franz and Virginia Bader Fund. Many have also successfully pursued gallery representation, run their own galleries and artists’ spaces, and worked in the production industry. More than half of our alumni are successful as full-time professors and academic leaders at some of the most rigorous art academies and universities in the US and abroad, and they have been part of the early wave of artists to earn doctoral degrees in emerging fields of practice-based arts research, especially in service to digital media. Contact our Graduate Program Director, Professor Lisa Moren, lmoren@umbc.edu for more information or to receive a tour of our facilities.